The Rochester Orienteering Club hosts their annual trail run on Saturday, November 2nd, 2013 at Mendon Ponds Park. The trail run offers participants 5K, 10K, 20K, and 50K race length options. Last year’s trail run drew 200 participants, participation in this year’s event is limited to 300. The 50K trail run is part of the USATF Niagara Association’s Ultra Series. The 20K and 50K trail runs are the last in the 2013 TrailsRoc Trail Runner of the Year Series. The trail run begins at 8:00 am for those in the 50k event, 9:30 am for all other distances. Trail run costs vary by distance and date of entry – $15-$35, please consult the web site for details and pre-registration. After adding bike lanes, city transportation planners have gone a step further to create a safer biking environment. The new tool is called a bike box. Two bike boxes can be found at the Ford Street and Mt. Hope Avenue Intersection, as well West Main Street and University Avenue. 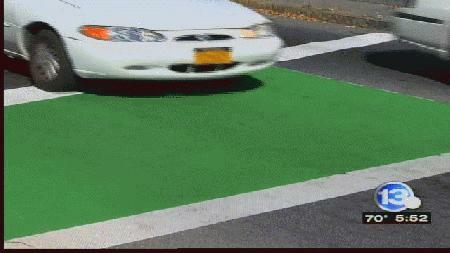 A third box that does not have the green paint will soon be finished near South Goodman Street and Monroe Avenue. The city intends to see how successful the boxes are in lessening accidents, and making biking travels easier for cyclists. It chose the three intersections because there was already maintenance work being done there. And these intersections were viewed as potentially confusing or dangerous for cyclists, according to city Transportation Specialist Erik Frisch. “If it’s something that’s going to help the bikers, the drivers just have to be a little bit more patient,” said Stacy Astudillo who works near Ford Street. It’s back! Join Grossmans Garden & Home for old-fashioned Fall family fun. Enjoy kids activities and crafts, seasonal taste-sensations and of course…the sounds of children chunkin’ pumpkins! 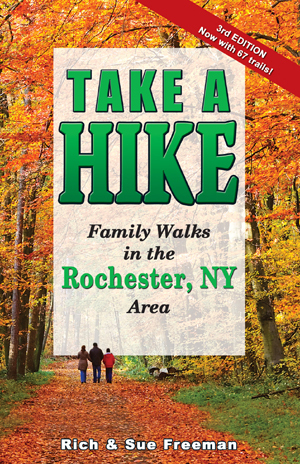 Proceeds to benefit Breast Cancer Coalition of Rochester, Verona Street Animal Shelter & Genesee Land Trust. We’re also collecting canned goods for local food pantries. HOW: Visit www.grossmans.com or call 377-1982 for additional details. Grossmans Garden & Home, has been Rochester’s premier gardening destination for over twenty five years. As a year-round garden inspiration center, Grossmans Garden & Home strives to inspire and enrich the lifestyles of garden enthusiasts, young and old, with the highest quality homegrown flowers, trees, shrubs, garden art & furniture. For more information about Grossmans Garden & Home, call (585) 377-1982 or visit our website at www.grossmans.com. Sheesh, you’re thinking, Amos must be some sort of highly placed international official in maritime law. … Nah. He’s a 50-year-old geologist who heads a tiny nonprofit called SkyTruth in tiny Shepherdstown, W.Va., year-round population, 805. His satellite analysis of the gulf oil spill in 2010, posted on SkyTruth’s Web site, almost single-highhandedly forced BP and the U.S. government to acknowledge that the spill was far worse than either was saying. He was the first to document how many Appalachian mountains have been decapitated in mining operations (about 500) because no state or government organization had ever bothered to find out, and no one else had, either. His work was used in the Environmental Protection Agency’s rare decision to block a major new mine in West Virginia, a decision still working its way through the courts. “John’s work is absolutely cutting-edge,” says Kert Davies, research director of Greenpeace. “No one else in the nonprofit world is watching the horizon, looking for how to use satellite imagery and innovative new technology.” “I can’t think of anyone else who’s doing what John is,” says Peter Aengst, regional director for the Wilderness Society’s Northern Rockies office. Let’s go back to that fishing ship in the Pacific: How does Amos know so much about fishing ships, anyway? First, the basics: Chilean officials wanted to know if they had an illegal fishing problem off Easter Island, their territory 2,000 miles off their coast. Chile was working with the Pew Charitable Trusts on the issue; the Trusts hired SkyTruth to figure it out. The problem: These waters are one of the most remote places on Earth and cover 270,000 square miles. Amos began by going small: What would fishermen be after? Tuna and swordfish, it turned out. They were fished in certain seasons, and that narrowed both the type of ships he was looking for and when. Next, he hired a multinational satellite operation (Canadian-built, Norwegian-operated) to take radar images. Although each image covered an area of 115 miles by 115 miles, the region was so vast Amos needed strips of images to create a composite. This meant the satellite had to take a sequence of photographs. It took nine sequenced images: three strips of three images, taken from three orbits of Earth, at about $5,000 per image. But the radar map also showed other ships, ones with no transponders. Since they were in protected waters during fishing season, they were highly suspicious, some making the telltale back-and-forth patterns of trawling nets. “If the ship is big enough for us to detect on a satellite image, and they’re not broadcasting, we’re pretty sure it’s a fishing vessel,” he says, acknowledging it could be even more serious illegal activity, such as human trafficking or drug running. The picture that changed everything, though, was “Earthrise,” or NASA image AS8-14-2383, one of the most widely viewed pictures in history. As Apollo 8 circled the moon on Dec. 24, 1968, Earth rose on the horizon. “Oh, my God, look at that picture over there,” exclaimed mission commander Frank Borman. With a handheld camera, astronaut William Anders snapped a picture of Earth — a startlingly blue, startlingly delicate half-sphere — floating in a black void, above the pockmarked surface of the moon. John Amos, growing up in Rochester, N.Y., remembers that photograph, for he grew up in a scientific household. His father, after completing his military service, became a geologist and paleontologist for Ward’s Natural Science Establishment, a firm supplying instructional materials to science teachers. His mother, Jackie, worked at the public library and, at night, ironed her children’s socks and underwear. In this highly disciplined environment, the fields of science, astronomy, geology gleamed. The natural world seemed a wonder box teeming with mysteries. “I can recall many frigid, crystal-clear winter Rochester nights in the back yard with Dad, gazing at the rings of Saturn and looking for meteorites while trying to ward off frostbite,” Amos wrote in a eulogy for his father earlier this year. As the years passed, Amos was, in fact, developing second thoughts. He says a “series of small epiphanies” led to his conviction, in the late 1990s, that he was aiding in the over consumption of Earth’s resources. Given his family background, this was a serious moral issue. The decisive moment came when he came across a 1993 image of the Jonah oil field in Wyoming: sagebrush, grassland, cows, pronghorn antelope, a few gravel roads. He got a fresh image for a project he was working on. In just a few years, the gas wells — five-acre pads — had multiplied, as had the roads accessing the remote sites. “It had gone from ranch land to industry, just that fast,” he says. At the same time, they were burning out on Washington — “the glamor was sort of gone,” Mathews says. They attended Shepherdstown’s annual arts festival one year by chance. They fell in love with its Mayberry charm and in 2003 bought a house outside town, the back deck hidden in a canopy of shade trees. After a few more gibes, she turned to lecturing. Offshore drilling, particularly conducted by rigorous American standards, she said, posed no realistic threat to the environment. She said he was trying to frighten people with misleading satellite photographs. “You do a great disservice — you and your organization — in not telling the American people the truth about what happens in domestic drilling, on shore and off, and putting it in the perspective that it deserves,” she said. He went on to catalog his computations with MacDonald, concluding that the spill had to be at least 6 million gallons — about half the size of the Exxon Valdez spill, then the worst in American history — and was now gushing at 20 times the rate that BP and the Coast Guard reported. Amos, Manthos and Woods near their office in Shepherdstown. Amos founded SkyTruth as a one-man operation in 2001; now it has four full-time employees. The size of the spill is still being fought out in court. But it’s at least 172 million gallons. SkyTruth had broken through. The little plane bumps along the airstreams, jolting its way south, toward Beckley and the heart of coal country. “Every time you come up, you see some new s—,” White says. Lake Effect Ice Cream opened its new Lockport ice cream parlor, a cone’s throw from the Erie Canal, in June. Tourists have been flocking to the store, no doubt having earned a fling after soaking up the canal’s backstory for a solid hour. The store (79 Canal St., Lockport) usually carries more than 25 flavors from Lake Effect’s far-ranging menu. That includes established favorites like Salty Caramel and Frozen Hot Chocolate, and wacky ones like Love Potion # 9 (raspberry, lavender). The biggest draw to the new shop isn’t the ice cream – it’s what they can build with it. Lake Effect pints are already available at many area Tops Markets and Wegmans. The shop also offers floats, ice cream coffee drinks and ice cream cookie sandwiches the size of a baby’s head. But people have been driving to Lockport for their sundaes, said Jason Wulf, who runs the company with Erik Bernardi. Wulf said he drew inspiration for the sundae from a trip to Scotland with his wife, Heather. At a restaurant he experienced the Scottish dessert cranachan, which involves whipped cream or pudding, honey, whiskey, oats and fresh raspberries. “I wanted to bring something back from that trip, and it just seemed perfect,” he said. Lake Effect already made whiskey ice cream. Another popular sundae is the Morning Commute, with Mocha Cappucino ice cream, chunks of Paula’s Donuts, whipped cream, chocolate sauce and chopped walnuts. 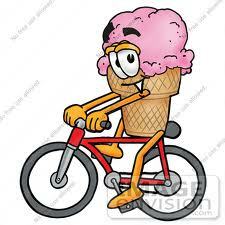 For info, visit www.lakeeffecticecream.com or call 201-1643. Click here for a comedic look at Rick French, the fearless Leader of Pack Paddle & Ski as he and a few friends explore Conklin Gully and Parish Hill in Naples NY. As the video shows, Rick is an intrepid leader who leads groups on adventures all over the world. Check out his trips at www.packpaddleski.com. 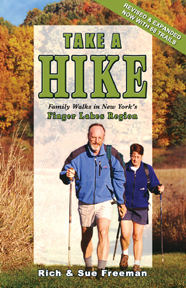 To explore Conklin Gully, Parish Hill and many more areas on your own, pick of copies of Footprint Press guidebooks such as 200 Waterfalls in Central & Western New York and Take A Hike – Family Walks in New York’s Finger Lakes Region. Click here to read Turning Point Park, a Gem of the Genesee, in Rochester, NY and watch a short video. It will make you want to take a trip there this summer for sure.